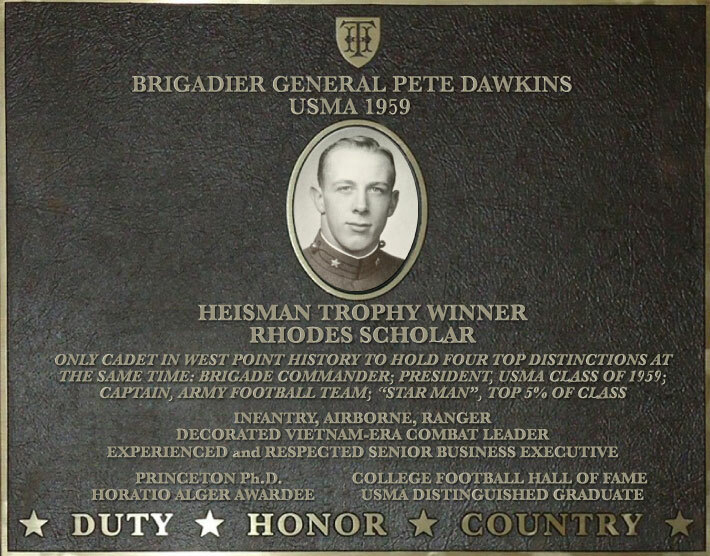 Pete Dawkins is one of the most well known West Point graduates of the 20th Century- having excelled in so many different aspects of American life. He was an outstanding cadet, Army athlete, decorated combat leader, General Officer, and led several large public companies as Chief Executive Officer. All of this success occurred after recovering from a bout with Polio as a child. Pete chose the Infantry as his branch selection, and was equally successful after graduation as he had been as a cadet. For his initial assignment Pete attended Oxford University for three years as a Rhodes Scholar, receiving his Masters Degree. In 1962 he returned to active Army service, attended Infantry Officer Basic, Airborne and Ranger Schools and was assigned to the 82nd Airborne Division as a rifle company commander. He deployed to Vietnam as Senior Advisor to the 1st Vietnamese Airborne Battalion, and was decorated with two Bronze Stars for Valor, and three Vietnamese Gallantry Crosses. He returned to the US, studied for and received his PhD at Princeton, and then taught at West Point. He commanded a battalion in 2nd Infantry Division in Korea, a Brigade at Fort Ord, another Brigade in the 101st Airborne Division, and became Chief of Staff of the Division. After being promoted to Brigadier General, he completed his career in the Pentagon as the Army’s Deputy Director of Strategy, Plans and Policy. After retiring from the Army, Pete became a Partner at Lehman Brothers for four years, heading the Public Finance Banking division. He then took a “furlough” from the world of finance as the Republican nominee for the U.S. Senate seat in New Jersey. After a spirited campaign, he lost in a close race to the wealthy incumbent. At that point, he returned to the private sector to head the US consulting business of Bain & Company until he was recruited away to head Primerica Financial Services, Inc as Chief Executive Officer – leading an organization of 125,000 employees around the world. After being CEO for five years, he moved to become Vice Chairman of Travelers Group, and then on to be Vice Chairman of Global Wealth Management at Citigroup. Most recently, he serves as Senior Partner of Flintlock Capital Asset Management – a global commodities Hedge Fund. Through it all, Pete has always remained loyal to the Military Academy, working actively on behalf of his Alma Mater, and especially in support of Intercollegiate Athletics and Army football. Throughout his career, Pete has always believed in public service, and has epitomized the West Point motto of "Duty, Honor, Country". In addition to 24 years of service in the Army and his run for the U.S. Senate, Pete has remained active in the field of national security. He led a panel of CEOs in a 2-year study for Secretary of Defense Bill Cohen, and was awarded the distinguished Eisenhower Award from the Business Executives for National Security (BENS) for his lifetime of service to the nation.